The MICO Platform is an environment that will allow to analyse “media in context” by orchestrating a set of different analysis components that can work in sequence on content, each adding their bit of additional information to the final result. 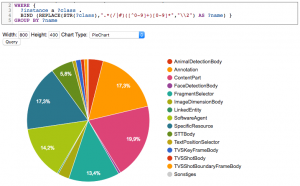 Analysis components can e.g. be a “language detector” (identifying the language of text or an audio track), a “keyframe extractor” (identifying relevant images from a video), a “face detector” (identifying objects that could be faces), a “face recognizer” (assigning faces to concrete persons), an “entity linker” (assigning objects to concrete entities) or a “disambiguation component” (resolving possible alternatives be choosing the more likely given the context). Further details are described in the deliverables D6.1.1 and D6.2.1. The primary goal of MICO is to build on existing extraction technologies and improve them so they can be used in cooperation instead of developing completely new extraction approaches. To ensure we have a sufficient diversity in cross-media extraction technologies right at the start of the project, several partners bring in technologies they have developed or they have been working with. The following table summarises the extraction technologies available to MICO. Some functionalities might be covered by different tools with different quality characteristics. For each tool we give the partner who has expertise and the license. Note that there are considerable differences in Open Source licenses: whereas the Apache and BSD licenses are very liberal regarding commercial use, the GPL typically precludes this kind of exploitation. We opted for an approach using a mixture of bash scripts and servlet configurations which is shown in the figure below. Every extractor deployed for the MICO system is obliged to support standard start-up and shut-down command line parameters. It also needs to be packaged with a short description bash script specifying the name, description and system (native, Java) it is running for. For easy changes and updates, the pipelines are configured in a separate Debian package. They specify the extractors to be loaded and the parameters to be passed in addition to the run/stop arguments. With the release of the final broker version 3 this system is not used anymore for creating MICO processing routes but rather serves as a simple run time configuration system that is now just responsible for starting and shutting down the extractors that might belong to different routes (via the broker web front end). It’s not required to be used though and could be replaced by a different distributed run time management system at any time. In the ideal case of a large scale distribute system, several instance of each extractor in each mode would just be run and execution order selection is completely carried out by the broker. Details about the broker are given in the broker section . 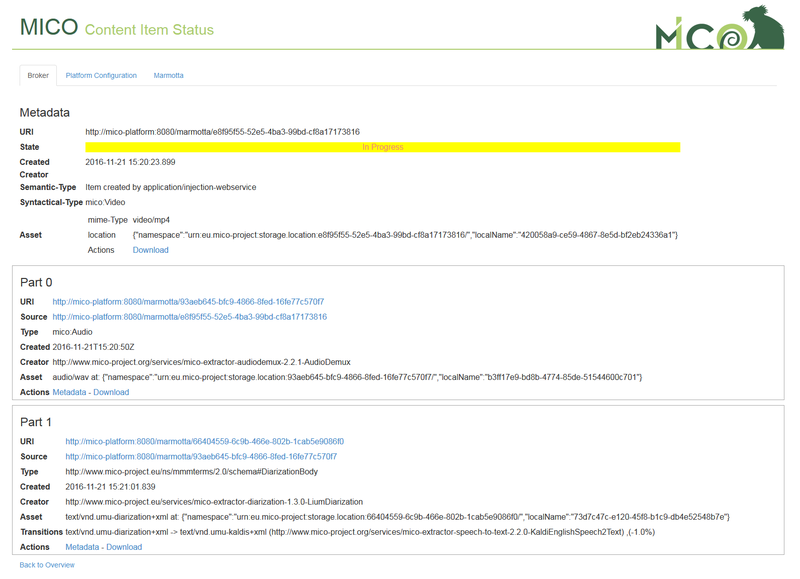 The item at the top represents the ingested multimedia object that has been sent to the MICO platform. Various extractors now add their (possibly multiple) parts to the whole metadata background that is created for the item. 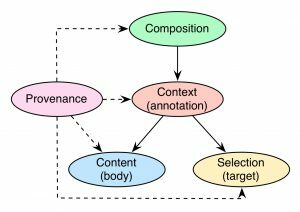 Every part itself adapts the structure of a Web Annotation, containing the information content and the target of the annotation (e.g. the whole multimedia object, or only temporal/spatial fragments of it). Different parts and their targets can be interlinked in order to generate the traceable path of work that has been fulfilled successively. For further information about RDF details please consider the official documentation of the MMM, one of the specification deliverables of the MICO project (volume 2 or volume 4), or the paper “A Platform for Contextual Multimedia Data – Towards a Unified Metadata Model and Querying” (which features a little bit older version of the model, however the ideas and the background remain the same). 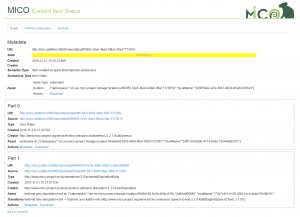 The MMM has been extended by a sub-ontology MICO Metadata Model Terms MMMTerms, which features MICO specific implementations of some of the extractors implemented during the MICO project. A Java-based application to make use of the MMM has been implemented via the open source library Anno4j. For a guideline of how to use Anno4j, refer the last tech deliverable of the MICO project (volume 5, which is soon to be published here) or the paper “Anno4j – Idiomatic Access to the W3C Web Annotation Data Model” in the ESWC 2016 Satellite Events. The MICO broker is responsible for orchestrating heterogeneous media extractor services, and hence is the key for realizing the potential of multi-modal and complex media extraction workflows. Further information are available in blog series about the broker. PREFIX Prefixes allow to shorten URLs. They are optionally defined on the top of a SPARQL query. SELECT, CONSTRUCT, DESCRIBE, and ASK. DATASET This block allows to specify the context(s) in which the query is evaluated. SELECTION This block (WHERE) may contain triple patterns, optional clauses, existence checks and filters. LIST OPS This block allows result ordering (ORDER BY) and segmentation (OFFSET,LIMIT). AGGREGATION This block allows result aggregation (GROUP BY, HAVING). The figure shows a SPARQL query that lists all classes (types) and their number of appearances. A wider set of SPARQL examples can be found in the Mico Technical Report Volume 3. 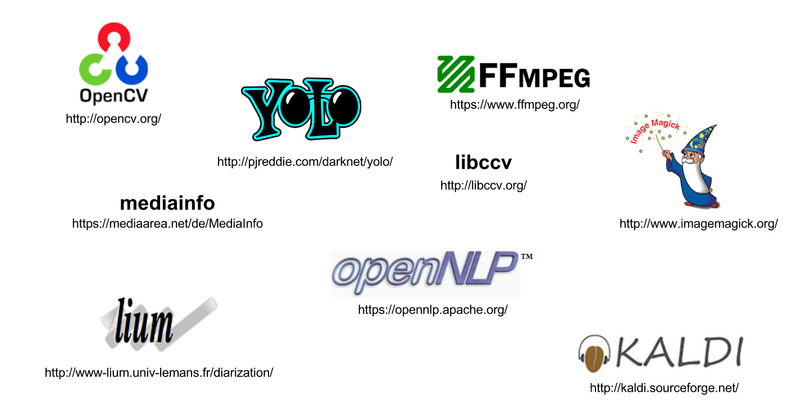 SPARQL-MM is a Multimedia Extension for SPARQL. The extension includes relation, aggregation and accessor functions for media fragments but is under continuous development. A complete function list if the current version (SPARQL-MM 2.0) can be found in the Mico Technical Report Volume 5 and on the code repository of the reference implementation. The following examples show some simple SPARQL-MM queries. Example one presents a spatial relation. Example two shows a temporal accessor. Example 3 shows a spatio-temporal aggregation. in usage. LDPath, a path traversal language similar to XPath or SPARQL Property Paths is such a straight-forward candidate. In Mico we use it internally for Anno4J filter mechanism. Additionally it is available via Marmotta webservices. The figure shows a LDPath query that returns the labels of all extracted topics for a single content item. More LDPath examples can be found in the Mico Technical Report Volume 5. MICO’s recommendation is about providing a framework that uses both collaborative filtering and content-based approaches for recommendations within the platform. input media sharing the same context. For the collaborative filtering cases, MICO uses prediction.io as a highly customizable recommendation framework. 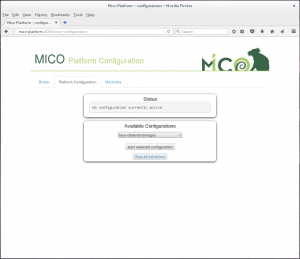 Within the MICO platform,Inside MICO it is coupled within an optional Docker module. Example configurations are available for Site statistics and image likes. Inside the MICO platform, a REST api handles the communication with prediction.io for getting recommendations. See the section on “Getting recommendations” on how to install the WP5 modules. For the cross-media recommendation, the project focuses on providing infrastructure for implementing a cross media workflow as described by Köllmer et.al in A Workflow for Cross Media Recommendations based on Linked Data Analysis. The main application being the “Editor Support Showcase”. The second cross media recommendation application is filtering of Zooniverse subjects in debated items, to recommend them for expert review. Integration of recommendations within the MICO platform. The overall infrastructure is depicted in the figure. Note, that the recommendation gets content metadata out of the Marmotta triple store via Anno4j, i.e. uses metadata provided by MICO extractors. For further information, see the recommendation repository and the description in “Getting recommendations“. 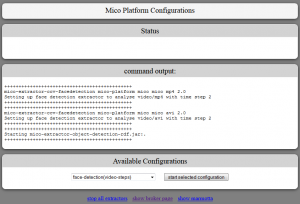 This section guides you through the installation of the MICO platform on a Linux Debian platform. For quick-start use the virtual machine image with the pre-installed MICO platform. The hostname plays a very important role and can not be easily changed later. So you should not use IP addresses or FQDNs that conflict with existing names. All platform services get started on boot. The extractor pipelines can be started using the configuration Web interface. Now you can go on installing extractors. The necessary configuration parameters are queried during the installation of the packages. Most of them have proper default values you can go with. Some of these configuration values can be changed afterwards using the packaging command line tool dpkg-reconfigure <package-name>. Changing the configuration needs a restart of the affected modules, that might include the platform and all extractors. 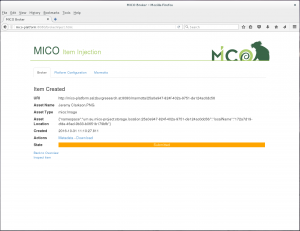 mico-base package configures the MICO username, password and home directory: These configuration parameters are used in several ways and therefore should not be changed without being cautious. A system user is created on Debian with the given password and home directory. All extractor processes will run as this user. 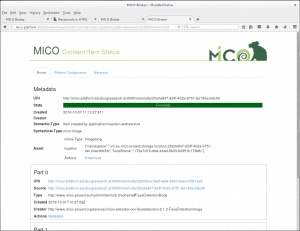 The MICO API uses RabbitMQ for communication. During installation of mico-rabbitmq a RabbitMQ user according to these values is created. 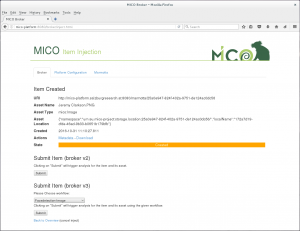 These packages use the credentials to connect to RabbitMQ: mico-broker, mico-configuration and mico-persistence. Marmotta (mico-marmotta) uses the credentials to create a user for it’s backend database on PostgreSQL. 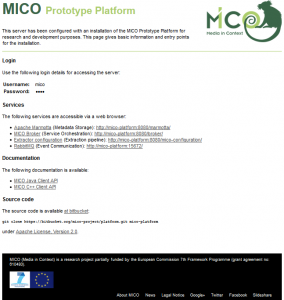 The mico-registration-service is responsible for managing the registerations of extractors for the platform. It’s package configuration values affect the database for storing the extractor management data only. 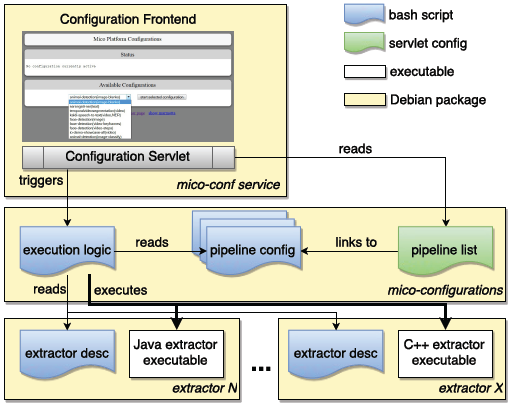 The mico-workflow-management-service handles the extraction workflows. The necessary data is stored in a database, where the package configuration handels the database settings. 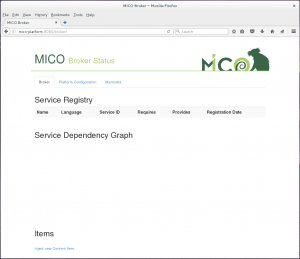 The backend storage that is used by the broker, extractors and all other components using the MICO API can be configured in the JAVA Broker context. You can find the context configuration file at /etc/tomcat7/Catalina/localhost/broker.xml.tmpl and adapt the parameter mico.storageBaseUri to your needs. Don’t forget to do a dpkg-reconfigure mico-broker. All components need to be restarted if changed, as this (new) setting is communicated on startup. More configuration settings can be found in /etc/tomcat7/Catalina/localhost/*.xml.tmpl. If you have any troubles you might want to check the log files. 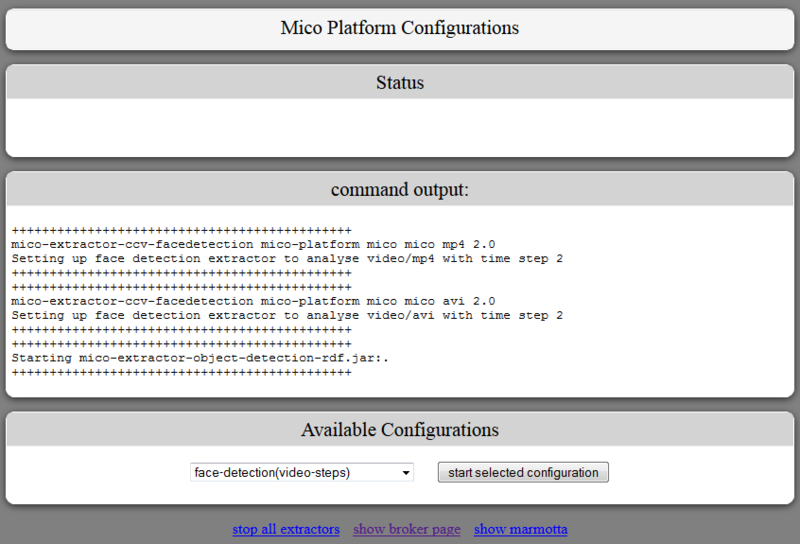 The logs of the Platform can be found in /var/log/tomcat7/ and for the extractors /var/log/mico-extractor-<extractor-name>/. Make sure you have a running MICO platform before installing any extractor, as the extractor will register iteself during installation and the registration service is part of the core platform. If you have a graphical user interface you can use your Package Manager of choice or just open a command line shell with root privileges to install the extractor packages. The following extractors are publicly available (the package name is in brackets). Install them by using your Package Manager of choice or open a command line shell (with root privileges) and type apt-get install <package-name>. To uninstall an extractor you can use apt-get purge <package-name> <registration-package-name> (a registration package comes along with every extractor, named like the extractor packges with an -registration appended, so make sure you also uninstall this). The virtual machine image provides a ready-to-use installation of the platform and can be downloaded as Open Virtualization Format (OVF). This format is supported by most current virtualization software. We recommend the use of VirtualBox. The image is not intended for use in public or untrusted environments! The reason is that there are no safeguards against unauthorized (remote) access. Login to the MICO platform via SSH on port 22022 (is forwarded to 22 on the guest) with Username user and Password user. The default user and password for accessing the MICO platform services is mico. Have a look at Content injection to a pre-defined workflow for a first try. 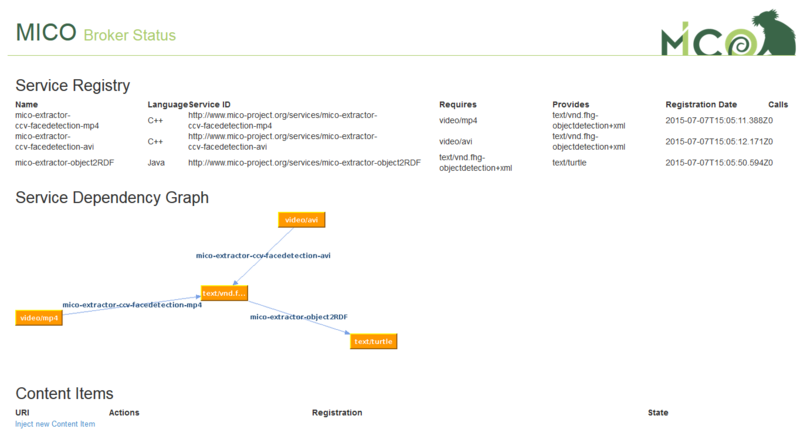 The MICO Platform is shipped with some pre-defined workflows. Before you can start processing items you need to make sure the necessary extractors are up and running for the workflow of choice. This of course applies to all kind of workflows (your own or pre-defined). 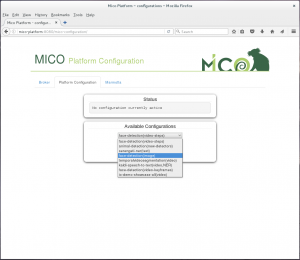 For pre-defined workflows you can start the necessary extractors via the Platform Configuration web interface: http://mico-platform:8080/mico-configuration/ (supposed your MICO platform is available with mico-platform). 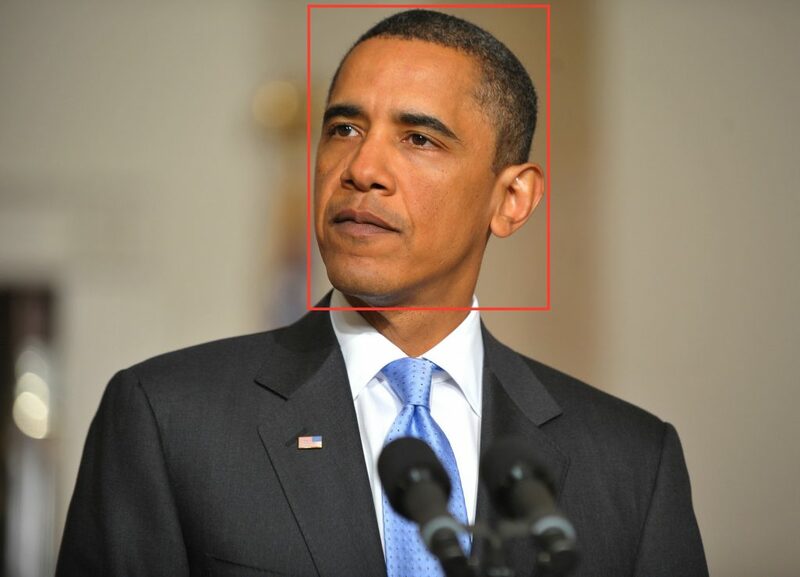 For face detection on images start configuration face-detection(image). To perform animal detection on images start the configuration animal-detection. 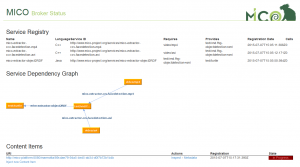 user and password: The username and password to register via RabbitMQ. The default is mico for both. start or stop: Start an extractor or stop it. extractor_args: Some extractors needs additional arguments on startup. Go to Broker page and click on Platform Configuration to start up requried extractors. Choose workflow (e.g. face detection for images) and click on start selected configuration. A command output window shows if the extractors got started. If any errors show up all extractors for the workflow are stopped even if they started properly. See the error message to get further information (e.g. extractor not installed, …). If you have already started extractors before from this user interface you can see this in the Status window. Go back to the Broker page, where you see the list of running extractors and a graph visualising their dependencies. To inject an item click on Inject new Content Item on the bottom of the page. Choose a file to inject, than the Syntactic Type gets chosen automatically. If not you have to change it manually. Click Create Item to upload it to the Platform. Click the submit button in section Submit Item (broker v2): The item will be processed by all running extractors that fit the syntatic type of the item. To choose the specific workflow the item should get processed, chosse the proper one under headline Submit Item (broker v3) and click Subtmit. The item will be processed by the extractor chain defined by the workflow. After that the State changes to Submitted. By reloading the page you can check the State which will go to Finished or Error. You also have an overview of all items and their state on the Broker page. To see the details and (intermediate) results of the processed item click on Inspect (on the Item Inject page or on the Broker page). There you see the current processing state, the item details and all extractor results. To see the stored results for the item in the Marmotta Triple store click on Metadata. After injecting new content to the platform the processing state (progress, finish, failed) is shown on broker start page. By clicking on Inspect link a list of extracted parts is shown as well as information about processing state of parts, like names of services that are analyzing the parts. If an error occurs during analysis process the broker will indicate an unsuccessful analysis request on the overview page, as shown in the picture below. By hovering the red “FAILED” line further information are shown. 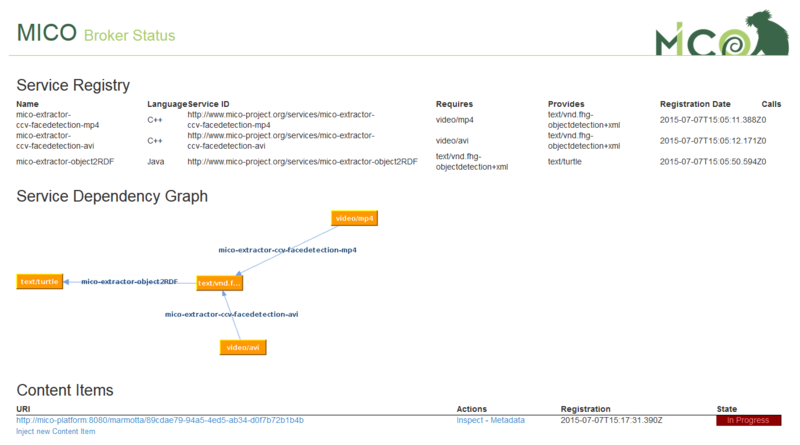 Extractor and platform developers can find further information in the log files. The log output of the platform core modules (Broker, Marmotta, etc.) are stored in the Tomcat log files in the directory /var/log/tomcat7/. Each extractor runs as own process and therefore has it’s own logging directory. This is located at /var/log/mico-extractor-<extractor-name>. To enable result querying in the Mico Platform we use the standard Marmotta query interfaces (that are partly an outcome of the Mico project). The User Interfaces are purely build on top of webservices, so the interfaces are accessible by both, human and machines. The query languages itself are exhaustively described within the Mico Technical Reports. In this section we give a short overview on the query interfaces. The Marmotta framework integrates the data visualization framework SGVizler that allows to turn SPARQL results into graph visualizations. Thereby it supports a broad set of visual types, like charts, maps, tables, etc. 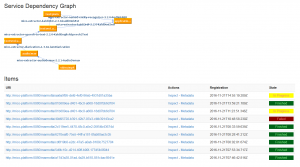 In addition to SPARQL, the Mico System (or the underlying Marmotta RDF Store) supports a Graph Traversal Language called LDPath. Starting from a resource, the whole data graph can be walked through. The user is rather simple but may be extended in further versions. Having built a *.war file, a manual upload to the tomcat manager webapp is possible as well: The showcase-webapp.war must be placed within the directory /var/lib/tomcat7/webapps/. The tomcat server detects and deploys the file automatically (startup usually takes two minutes). For collaborative filtering applications, prediction.io must be installed on the platform. The suggested way is to install prediction.io within a docker container to decouple its dependencies from the platform and make the installation process reproducible. After that, the recommendation API is available as described in the API documentation. store the Dockerfile inside bitbucket for testing. You have to adjust the path accordingly (e.g., change the username), see the Docker docs for syntax details. During the build phase, all of the prediction.io requirements (Spark, elasticsearch…) are automatically downloaded and configured inside the docker container. http://localhost:8000 for the prediction.io overview page. The source code for all Open Source extractors is hosted on the MICO extractor repository. The repository also contains detailed implementation guidelines for C++ and Java. The following section will guide through the process of annotating results. This means to the preparation of your own extractor and the incorporation of an extractor’s result into the RDF structure of the MICO platform. To do this, we will explain in short how the results are represented inside the MICO platform and what the RDF graph looks like, then we will show small examples that explain step by step of how to create results. 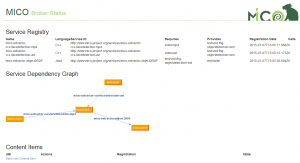 The MICO Metadata Model MMM (see also this blogpost) establishes the RDF ontology and therefore the model that is used for all intermediary and final results in the MICO platform. 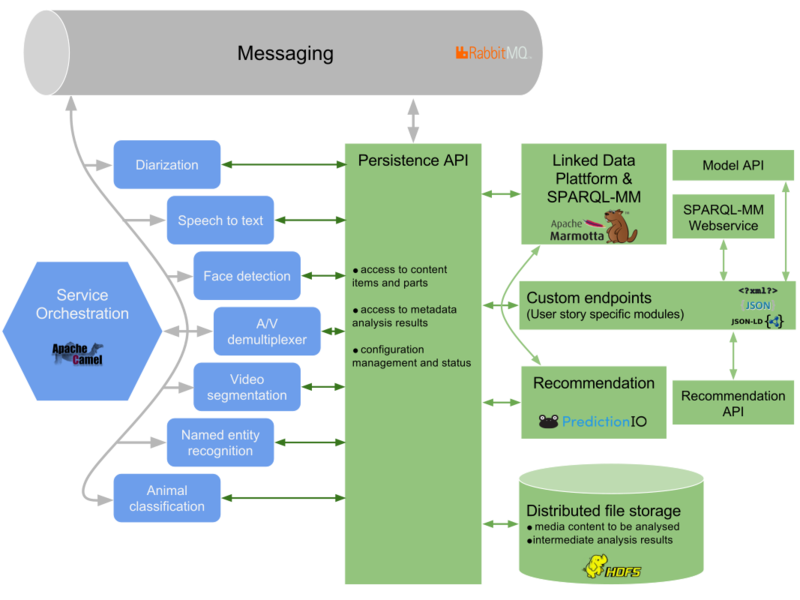 The MMM is an extension to the Web Annotation Data Model WADM, adding a layer of interlinkability and provenance atop the core concept of the WADM – the **Web Annotation**. These are utilised to support information about a given resource in a modular way. The core technical component to persist and query results is Anno4j (documentation is available on the github page, see also this blogpost, a paper is available here), which provides an Object-RDF-Mapping (ORM) that is utilised in order to turn simple Java POJOs into RDF metadata and vice versa. Anno4j is used for Java extractors, for the C++ pendants an extensions to the library called Anno4cpp has been implemented. For the interested user and for further clarification, we advise to read the MICO deliverables written in the period of the MICO project. Especially the last deliverable – volume 5 – contains detailed information and insights about all Anno4j functionalities and the MICO Metadata Model. The mapping of Anno4j is implemented through the utilisation of Java POJO classes as the main part. Optionally, namespace classes can facilitate the use of the RDF URIs, which can be quite long and complicated. Simple common code sharing (e.g. via Maven like the MICO platform and Anno4j) is enough in order to make one’s own implementation and extension to the MMM / Anno4j accessible to others. As soon as someone has your implemented Anno4j classes, others can persist and query for your knowledge/implemented ontology. * The person that is recognised on the input image. * The spatial fragment of the picture in which the person’s face is detected. * The confidence of the extractor about its result (optional). Anno4j and the MICO platform come with a lot of predefined classes for the Anno4j ORM mapping. Regarding the defined scenario, the implementation for the Part, the SpecificResource and the Selector is already present when including respective dependencies. What is missing is the node that represents the Body of the Part annotation. This is in general the main point to address, when you introduce new things to the MMM. * Interface Declaration: The Java nodes implemented must always be an interface and they should inherit from respective classes. In this case, as we want to implement a node with Body-behaviour, the interface needs to extend the Body interface. There are various classes predefined in Anno4j, like the Target, Body, Annotation, PartMMM, and ItemMMM. The top RDF concept is the ResourceObject, which needs to be extended when a new top level node is to be introduced. * Java-Code Annotation at Interface Level: The Java-code annotation added at top level (@IRI(MMMTERMS.FACE_RECOGNITION_BODY)) is responsible for the RDF type (relationship rdf:type in the graph) that is assigned to respective nodes. * Getter and Setter Pairs: A getter/setter pair defined in the interface will correspond to an RDF property or relationship in the RDF graph. For both the setter and getter, the same Java-code annotation needs to be added. In the case of the scenario, two pairs are added with the @IRI(RDF.VALUE) and @IRI(MMM.HAS_CONFIDENCE) annotation respectively. These result in the RDF properties rdf:value and mmm:hasConfidence. A Java workflow that would create all the associated RDF nodes and relations seen in the figure of the scenario above is shown in the following Java excerpt. When executed, the ORM mapping of Anno4j creates all associated RDF triples automatically and persists them to the supported SPARQL 1.1 triplestore. The code snippet makes use of the previously introduced FaceRecognitionBody. All platform services get started on boot. 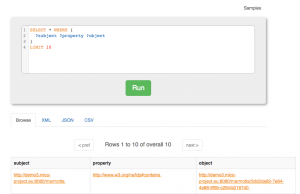 The extractor pipelines can be started using the configuration Web interface. See below for first steps. For ease of use, we developed a webinterface where you can start and stop the preconfigured extractor pipelines. The MICO platform and the extractor APIs are Open Source Software (OSS) and licensed under the Apache License Version 2.0. As for the MICO extractors, there is an “open business” approach: Many extractors are OSS (Apache License Version 2.0 or GPL) while other are closed source commercial software(e.g. they have been brought into the project as so-called “background knowledge”). The modular, service based MICO system architecture makes it easy to develop, deploy and run both types of extractors. We used a lot of existing open source software for extractor implementation (see Figure above). Thus MICO directly benefit from the scientific advances and improvements made within these popular OSS projects. 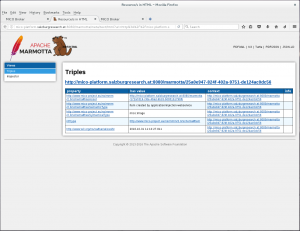 APACHE MARMOTTA™ (TOP-LEVEL PROJECT) IS AN OPEN PLATFORM FOR LINKED DATA. Apache Marmotta™ provides an open implementation of a Linked Data Platform that can be used, extended and deployed easily by organisations who want to publish Linked Data or build custom applications on Linked Data. Apache Marmotta™ is a project and a trademark of the Apache Software Foundation, independent of MICO, although our team is committed to the development and continuous growth of this project. Apache Marmotta™ is a trademark and project of the Apache Software Foundation independent of MICO. The Apache Hadoop™ software library is a framework that allows for the distributed processing of large data sets across clusters of computers using simple programming models. In MICO, we’re using the HDFS™ (Hadoop Distributed File System) as one storage implementation for media items. Apache Camel™ is a rule-based routing and mediation engine that provides a Java object-based implementation of the Enterprise Integration Patterns using an API (or declarative Java Domain Specific Language) to configure routing and mediation rules. (source: Wikipedia under CC Attribution Share-Alike license). 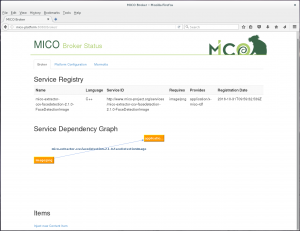 In MICO the broker v3 uses camel to define its routes. Apache PredictionIO (incubating) is an open source Machine Learning Server built on top of state-of-the-art open source stack for developers and data scientists create predictive engines for any machine learning task.